English: Congo swallow; French: Hirondelle de rivière; German: Trugschwalbe; Spanish: Avión de Río Africano. 5.5 in (14 cm). The plumage is glossy black overall and the beak, feet, and eyes are colored red. 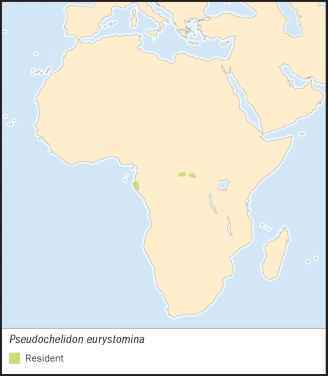 Breeds in coastal Gabon and inland along the Congo River and other large tropical rivers of central western Africa. After breeding it migrates far up the Congo River and other major watercourses in the region. It occurs in Congo, the Democratic Republic of Congo, and Gabon. 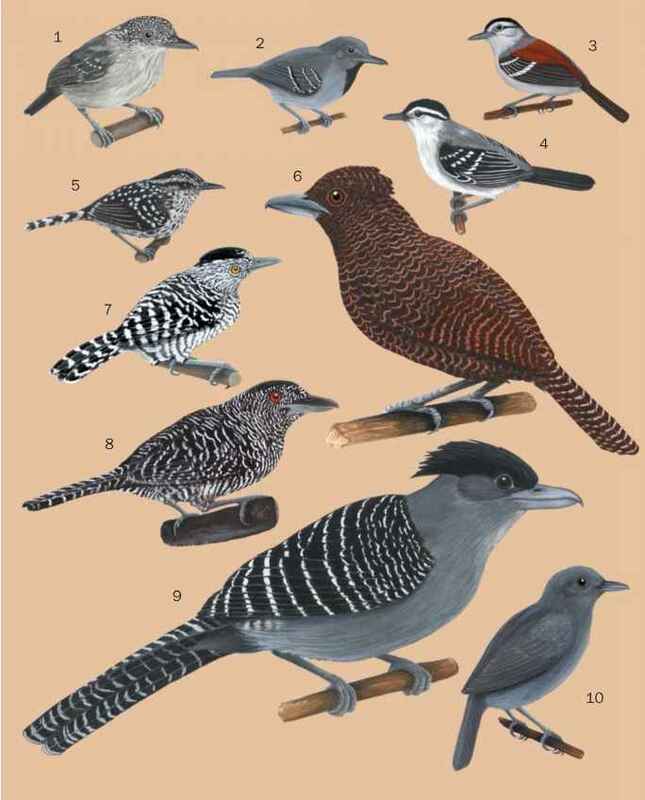 Breeds in sandy places along forested tropical rivers and in coastal tropical savanna. After breeding it migrates inland along large forested rivers, where it often roosts on sandy bars and embankments. The species is highly gregarious when breeding and also during migration. It defends a local territory around the nesting site, and attracts a mate by aerial displays and singing. Feeds on flying insects caught on the wing. Monogamous. Populations breeding on large rivers breed during the drier season, when sandy riverbanks are exposed. Populations breeding in coastal savanna breed from about September to November. Colonial nesting sites are in sandy embankments, dunes, and islands of large tropical rivers and coastal savanna. It digs a slanting tunnel of 6.6-10 ft (2-3 m) into soft ground for its nesting site. The clutch size is two to four eggs. Both parents share in the incubation and care of the young. A rare, little-known, but locally abundant species that is listed as Data Deficient.